To demount: (1) Demount wheel and deflate tire by removing valve core. DANGER: Do not take wheel apart before deflating, as otherwise it will blow apart and cause injury. Remove valve lock cone from valve stem and install valve cap. Remove nuts which hold wheel together. Work beads loose from seats on both sides. Use universal tire tool, Stock No. 41-1-780. Pry inner half of wheel off. Alternately pry one side, then the other. Avoid cocking wheel holes against studs. Lift off inner half of wheel. Turn tire over and remove other half of wheel. First stand tire up with valve at the top. Push valve from hole into tire. 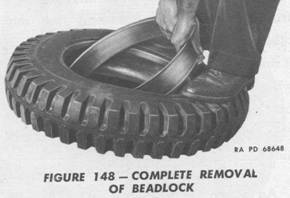 Push beadlock down, with the heel, into tire at point opposite valve hole.